This is my second post on the 'Power of Literature'. In my last post (here) I argued that literature can teach many things - how language works, knowledge of the world and every element of narrative form including characterisation, plot and story development. In this post, I want to suggest that literature 'enriches' our lives. I grew up in a working class home where there were few books and no television until I was 11 years old. For me, life outside school was made up of sport, exploring the bush, swimming and fishing in the creek, annoying my sister, and playing in the street till dark. I wasn’t read to and I can’t remember more than a couple of books in my house. So when I arrived at school I wasn’t a reader. Eventually, I learned to read from school readers. But it took 8 years of my life before I read my first complete book, not just a snippet of a book, a short story or a school text. I was 8 years of age and had been a reader for 3 years, but one Christmas I was given a copy of Jules Verne's 'Twenty Thousand Leagues Under the Sea' at my Dad’s work picnic. This book captured my interest as soon as I began to read it. It engaged me. 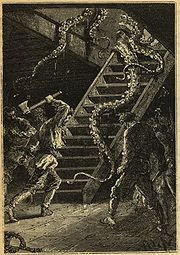 The quiet evil of Captain Nemo and his plan to use his cleverness to kill and terrify helpless seamen, captured my attention from the first pages. When the story took me into his cabin beneath the ocean’s surface, I could almost smell the leather in his furniture. I felt the panic of the sailors on the wooden hulled ships as the terrifying sight of a yellow-eyed monster came hurtling towards each ship in the darkness. As a child interested in making and inventing things I was fascinated by the technology alone, and was impressed by the fact that Verne wrote the book in 1869. This first introduction to science fiction offered depth and complexity that I’d never encountered before in school reading books. The book offered a richness of language, a complexity of themes and a simple but compelling plot that had me in as a reader. The book taught me new things about language (for example, the mix of French and English names and vocabulary was my first brush with a foreign language) and new things about the sea. It also introduced me to science fiction, which was a genre I’d not experienced before, and it introduced literary themes that were new to me. But the book did more than teach me about language, reading and literature, it enriched me as a learner and as a person; that’s what books can do! The reading of this book has stayed with me for 50 years and has been part of the foundations of my literary history and experience. It is related intertextually with other narratives read, seen, heard and experienced as part of my life (I discuss intertextuality in various publications including 'Pathways to Literacy' London, Cassell, 1995). ‘Literature is not just about story, it is about life and one’s world. It can act as a mirror to enable readers to reflect on life’s problems and circumstances; a source of knowledge; a means to peer into the past, and the future; a vehicle to other places; a means to reflect on inner struggles; an introduction to the realities of life and death; and a vehicle for the raising and discussion of social issues’ (pp 77-78). Sometimes books do many of these things concurrently. Let me share just one example. In E.B. White’s classic story ‘Charlotte's Web’ we don’t just encounter a cute narrative about pigs, spiders and a host of barnyard animals, we encounter a story with richness of character and plot and an array of literary themes that intersect with children’s lives; not just in the moment of reading, but well into the future. Books stay with you; they intersect with your own lived experiences and those of others. You can enjoy ‘Charlotte’s Web’ at the level of a simple narrative of a pig who meets a spider who has an impact on his life. But you can be moved by the rich thematic exploration of friendship, devotion, love, sacrifice and redemption. You can be amused, saddened, frustrated and confused by the characters and their actions. And you can certainly gain scientific knowledge about spiders. But beyond the things to be learned, here is a narrative so poignant that it buffets the emotions and can change the way we see things in our own lives. These simple words spoken by a spider, in a kid’s book, had stayed with him and helped him to make sense of the loss of his wife and the mother of his three-year-old son. The words of Charlotte, dredged from his literary history and experience, had comforted him with the thought that his wife had touched many lives with her care, kindness and friendship and that her life, though short, had been rich and well lived. This is what I mean by the power of story. Stories can ‘teach’ and stories can 'enrich' our lives too. D.W. Harding (1972) suggested that “reading, like daydreaming and gossiping is a means to offer or be offered symbolic representations of life”. I quote Harding not to relegate reading, and specifically literature, to the status of any representation of lived experience. This is the folly of postmodernism whose most extreme advocates would argue that all texts are equal, that the TV advertisement, graffiti, the bumper sticker, the poem, a Twitter ’tweet’, blog posts, a play and the newspaper editorial are all texts that can have equal value. The most extreme advocates of deconstructive postmodernism oppose the notion that some texts have greater value and contribute significant cultural worth. True, all texts have value, but I believe that literature as the pinnacle of the narrative form has special power and significance that must never be trivialised or reduced. Any civilised society that relegates literature to just one possible means to know and communicate is making a significant mistake. Reading literature offers the opportunity to grasp meanings in narrative form that are important. The words of other people, whether in spoken and written form, allow us to reflect on the consequences and possibilities of their experiences. Just as I am affected by human tragedy in my world, I am also affected by the tragedy of characters in books. So too with joy, amusement, fear, love, curiosity, love and sadness. For some fortunate children living protected and safe lives, books can also provide their first experience of hatred, death, disease, isolation, war, divorce and so on. These are aspects of the human condition that are important to understand without necessarily needing to experience them personally. Books allow us to reflect on these and other experiences, and hence come to a greater understanding of our world and ourselves. Literature also fulfils another vital function; as we share an experience of literature, it can act both as mortar to build rich personal and textual histories, and can act as bridges between our lives and the lives of others. Over the next few posts I intend to unpack a few of the ways that literature has an impact on our lives, in order to argue that it has special value, even in this multimedia age. The story is a simple predictable book situated on a farm. 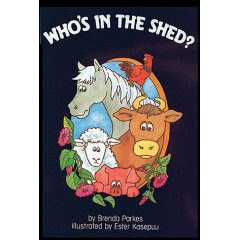 A truck arrives in the night and the next day the farm animals take it in turns to peer through the cracks of the shed to work out who has been put in the shed? The climax of the story comes when the pig finally looks and the circus bear roars “HOW DARE YOU STARE!” When I tried to read this to Jacob aged 19 months, I wasn’t able to sustain his interest long enough to reach the end of the story on the first two occasions that I read it. But by the third reading a day or so later I reached the climax of the story, and growled as the bear was revealed. Jacob jumped slightly and said “again”, meaning of course he wanted it read again. On the next reading when the final page was reached and I roared the words of the bear he jumped and ran to the door of the room looking back at the picture. He didn’t want to hear it again that day. For several days he would enter the room and move tentatively towards the book, open several pages then retreat to a safe distance and make a growling noise. It took him some months until we could read it again. 3. What had Jacob learned? In this simple example we see illustrated the partial answer to Margaret Meek’s question. Literature provides one significant way in which children explore the sometimes troubling territory of fantasy and reality, truth and fiction. They may never meet a real ‘villain’ but they can encounter many in books. In the world of literature they will encounter new fears but also wonderful lessons concerning justice, love, life, death, human diversity, hope and despair. 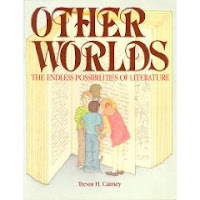 I wrote a book some years ago titled ‘Other worlds: The endless possibilities of literature’ (1990). The title pointed to one of the key concerns of the book, literature opens up worlds not normally available to be experienced firsthand by children. In my future posts on this topic I intend to build on this post as I argue for the special place that literature plays in our lives and the key role that it should have in any home or classroom. Humour is an important part of life. People need to laugh. Laughter reduces tensions helps us to relate to one another, releases tension. But while we can all recognise humour when we see it or experience it, it’s tricky to define. One simply definition that I like from WordNet is “the quality of being funny”. But there is always a fine line for children between being amused and being scared. That's why parents need to look carefully at some books that focus on humour; some are dark and scary and perhaps not helpful for young children still working out the difference between fantasy and reality. It is only as children grow in language proficiency that words begin to be a source of amusement and their sense of humour grows. From the age of five children begin to enjoy word play much more, to enjoy cartoons, and to grasp the beginnings of satire. It takes many children up to their 10th to 12th years to develop a more complete sense of humour. However, humour and laughter are more than just an enjoyable part of life, it would seem from research that humour has some positive physical, emotional and relational consequences. As a result, it is increasingly used in therapeutic situations. Research has shown that humour “…has the power to motivate, alleviate stress and pain, and improve one’s sense of well being” (read more here). Educators have also found that humour can be motivating, especially for boys. In fact for some boys, at times it seems to be the only thing that works. Humour has enormous positive benefits for early literacy learning. It helps children to engage with stories and the language that is used to create stories. This in turn helps them to listen to story reading longer, and to want to read books for themselves. This is particularly the case with boys. Boys seem to remain fixated on slapstick comedy, enjoy the unexpected and gross more than girls, and for a longer period of time. As well, the humour is usually more effective in books when it is more than just cleverness with words; illustrations can support clever word use in cartoons, rhyme and verse. Ultimately, the best examples of humour for children rely on brilliant use of language to create the absurd, the surprising, the unexpected and the outrageous. In the rest of this post I thought I’d share a few examples of books that children find amusing and motivating. It is not meant to be comprehensive so I'd welcome your examples via the comments. There are many children's stories that rely on humour. It is hard to go past Dr Seuss in this category. His books all use simple language and illustrations used in surprising ways. 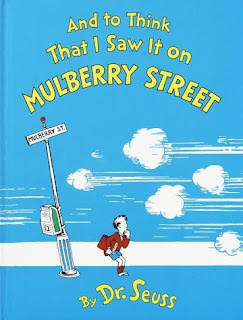 He set the pattern with his first book ‘And to Think That I Saw It on Mulberry Street’. This is the story of a young boy named Marco who while walking down the street runs into a horse and cart that suddenly appears to take on some special qualities; it becomes a chariot pulled by a zebra, then a reindeer takes over, followed by a sled pulled by an elephant etc. The images have what became the characteristic Seuss colour, sharp lines and simplicity of language and structure. Language that is rich, repetitive and rhythmic. What child wouldn’t be amused by the thought of having duck feet, a whale spout or an elephant trunk? I did a full author focus on Seuss in an earlier post (here). But Dr Seuss isn’t alone; there are other accomplished writers who have mastered this type of humour. 'Flat Stanley' by Jeffrey Brown - In this story Stanley is flattened one night by a large bulletin board that falls on him while he’s asleep. Much to his families surprise he survives and they discover that there are advantages to being flat, including being able to go under doors, flying like a kite and being able to go on holidays via the postal service. “The Shrinking of Treehorn” by Florence Parry Heide – Tells of a child who realises one day that he is shrinking. Treehorn is unable to get his family and his teacher to take notice of him when he suggests that he is shrinking, “Nonsense Treehorn, no-one shrinks”. ‘Well I am” said Treehorn. ‘Mr Popper’s Penguins' by Richard Atwater – After writing a letter to Admiral Drake at the South Pole, Mr. Popper receives a surprise that changes life for his entire family. ‘Penny Pollard’s Diary’ (1983) written by Robin Klein and illustrated by Anne James - Not strictly a narrative but a diary or journal in narrative form. This wonderful story about a girl who loves horses but hates 'girly' things', old people and school work, tells how she is changed by meeting a feisty 81 year-old woman named Mrs Bettany. The book was 'Highly Commended' in the Children's Book Council Awards in 1984 and was one of many awards won by Klein. This was followed later with 'Hating Alison Ashley' (1984) that was also produced as a stage play and a film starring Delta Goodrem. All of Klein's books have special appeal for girls but boys also enjoy them. Roald Dahl is perhaps the master of the absurd tale. His many books almost all use this approach to draw the reader in and amuse them with outrageous storylines, unusual characters and events that are atypical of those they’d meet in daily life. His many classics include 'Charlie and Chocolate Factory', 'Boy', 'Fantastic Mr Fox', 'Matilda' and ‘The Twits’. The official Roald Dahl website contains details on all his books plus much more (here). In Australia Paul Jennings has also shown mastery of the deceptively difficult job of being outrageously funny. Like Dahl, Jennings writings have always been a bit on the edge and hence he has sometimes been criticised for being so. But his books have opened up the joys of reading to countless boys who had not previously read. His recipe is simple. Give them short, fast moving funny stories that surprise and entertain. His early series of collections of short stories did just this and books like 'Unreal', 'Unbearable', 'Unbelievable', 'Uncovered', 'Undone', 'Tongue-tied' were page turners that kept boys interested. His 'Wicked' series written in partnership with Morris Gleitzman went one step further and provided a related series of six short books. Paul Jennings website has a complete list of his work (here). ‘A Series of Unfortunate Events’ was where Handler’s writing for children began. It is a series of 13 (!) books about the adventures of three children, the Baudelaires, who are orphaned after the death of their parents in a fire. The setting of the series like the rest of the events of the 13 books is surprising, and Handler includes many literary and cultural links and asides, clearly amusing himself along the way. A film adaptation of the first three books in the series was released in 2004, as Lemony Snicket's A Series of Unfortunate Events. There is also a video game adaptation of the same name. Audio books have also been released complete with songs from the books, featuring The Gothic Archies. Some parents will find these books a little dark - amusing 'horror' for kids! Frankly, I find them just too dark and scary. However, older boys (in particular) love them. I wouldn’t give them to my children until at least 13+ years of age, although a couple of Snicket's books would suit younger readers (e.g. 'The Lump of Coal'). I also love his most recent effort ‘The Composer is Dead’. A murder has been committed in the symphony hall, and the culprit is lurking in the orchestra. This is a bit like a Peter and the Wolf for the 21st century. It comes with a CD featuring narration by Lemony Snicket and original music performed by the San Francisco Symphony Orchestra. It has spurned a number of performances by Snicket with the San Francisco Orchestra (here). In the words of Snicket "I like to think of it (the book) as a gateway drug that will lead to a lifetime addiction to classical music". You can view a video excerpt below. 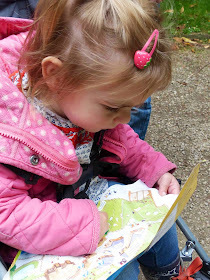 Even before many children become readers they have experienced the fun of jokes, rhymes song and verse. In Australia June Factor wrote a wonderful series of books to capture some of the best playground verse. With titles like 'Far out Brussel Sprout' and 'Unreal Banana Peel' you should get the idea (click here). Such playground rhymes and chants that tried , most of which is very funny but often it was devised with social comment in mind, and passed on knowledge and cultural understanding (plus some bigotry and racism at times). There are many examples around the world of such collections. Children love them. Writers who exploit a combination of verse, story, rhyme and illustration include Richard Scary (1919-1994) who is a stand out. His books are timeless (click here). This American author and illustrator published over 300 books with sales of over 300 million. His most famous series of books was ‘Busytown’. Scary's main characters are mostly anthropomorphic animals. Busytown is no exception. It is inhabited by an assortment of unusual animals. The main characters include Huckle Cat, Lowly Worm, Mr Frumble, police Sergeant Murphy, Mr Fixit, Bananas Gorilla, Hilda Hippo, and Farmer Fox. Scary’s books have been translated into 30 languages but the illustrations alone can be ‘read’ and enjoyed by children irrespective of language barriers. Scary’s many books have also been featured in videos, games and other merchandise. One of my favourites is the Busytown video which all my grandchildren have loved from a very early age (2 years and up). You can view a video introduction below. Many children’s authors also include verse, song and rhyme as part of their books. One of the best is Roald Dahl. All his books are filled with examples. I was excited to find recently a collection of many of these songs and poems published in a collection since Dahl’s death (1916-1990). 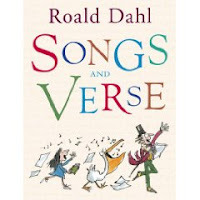 The book is simply called 'Roald Dahl Songs and Verse' and is published by Puffin. It is beautifully illustrated by Quentin Blake who did many of Dahl’s books and contains 190 of our favourite examples from his books. These include ‘Concerning Violet Beauregarde’ from Charlie and the Chocolate Factory, ‘The Anteater’ from ‘Dirty Beasts’ and many more, including five previously unpublished examples. Joke books also have their place and reinforce for young children that you can pick up a book for a few minutes just for the joy and fun of it. Some of these books tend to emphasise the ‘gross’ side of humour (for example), but others offer a more balanced approach. Either way, kids will enjoy them. You can even buy sets of jokes contributed by children. One example, ‘501 Great Aussie Jokes’ is published by Camp Quality in Australia also helps to support their important work in supporting children with cancer and their parents. 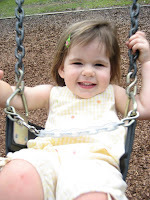 Children love fun and laughter, the surprising, the unexpected and the outrageous. But rhymes, jokes, verse and songs are more than just enjoyable, they teach about language and demonstrate the wonder of word play. This is surely one of the foundations of good writing and is a great way to encourage children to become avid readers.